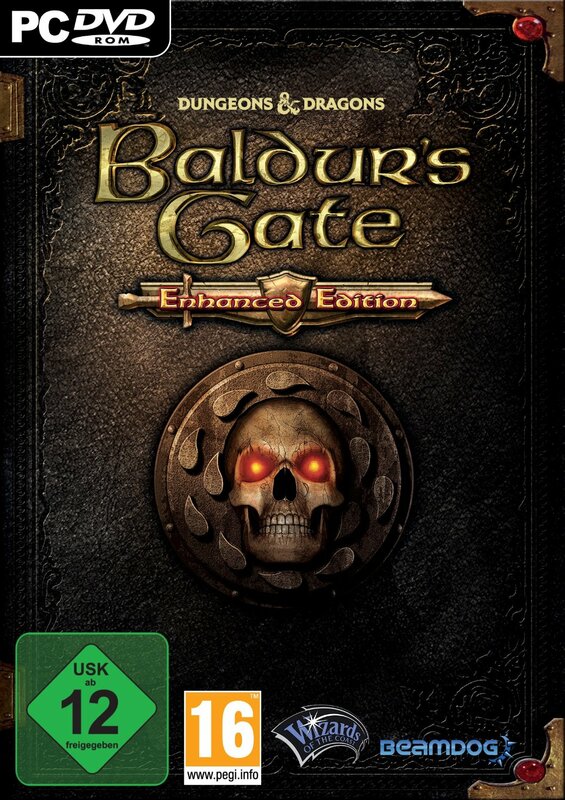 Recently we partnered with Koch Media to release Baldur's Gate: Enhanced Edition, Baldur's Gate II: Enhanced Edition and Icewind Dale: Enhanced Edition in Germany. 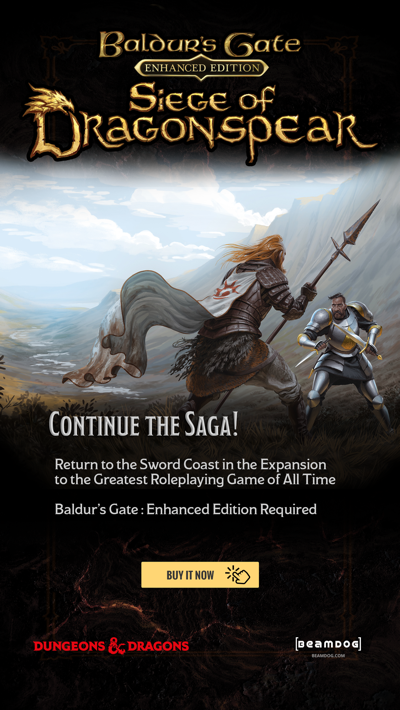 In their press release, Koch Media discusses the history of Baldur's Gate and their enthusiasm for acquiring this new product. We're enthusiastic about the cool German translations on the box. Fans can acquire these beautiful physical copies of the games on Amazon , or contact your local game store to see if they carry the game. Baldur's Gate: Enhanced Edition has German voiceover work as well as text. 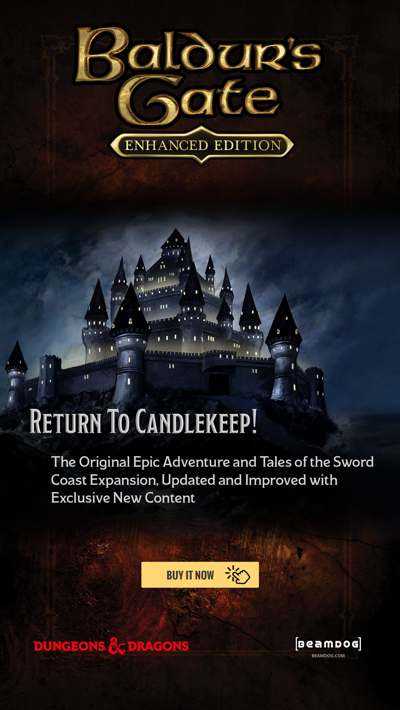 Icewind Dale: Enhanced Edition has a little German voice work in addition to its text, while Baldur's Gate II: Enhanced Edition has only German text. The enhanced edition games have a number of language options, which are provided thanks to volunteer work. The process of translating a game's text into another language is called “localization” and we continue to work on adding languages to our games. If you're interested in assisting with localization, you can visit our forums to see the list of languages and teams we have going. Contact the leader of the team you're interested in joining, or send an email to social@beamdog.com and we'll point you in the right direction. Once a prospective translator gets in touch with a team leader, the two discuss availability and the role(s) the translator will fill. Then the team leader puts the translator in touch with Jalily, our localization coordinator, who sends the translator a non-disclosure agreement. These are needed even for released games, as the translators need to be informed of patch dates, version updates, and the like. After the NDA is signed, Jalily sets the translator up with permissions in the system and the work can begin. Localization isn't just translating one word after another. Languages operate by different rules, and a translator has to be creative in interpreting some lines. For example, English does not have gendered words but many languages do. Imagine a scene in Baldur's Gate where a number of generic soldiers march by. In English, we could call them all "soldier." In French, the male sprites would be "soldat" while the female sprites would be "soldate." Many Dungeons & Dragons specific terms also have no equivalent in other languages. Take the fearsome ankheg. How does that translate into another language? Our translators work to find a good equivalent or invent new words as needed. That's it for our spotlight on localization. Check back next week for the results of our contest!